Teaching your child how to cook or bake takes a lot of time, patience and persistence. It also involves quite a lot of planning, and buying ingredients. I spend quite a long time each month planning out menus for our family and then figuring out which ones the kids can help cook. The boys love to get involved in the cooking at home, and so when we were invited to try the Fun Little Foodies cooking classes we were excited to join. There are very few companies or restaurants in the north east that have cooking classes for kids, although many people are interested in widening their menus or doing something together that isn’t swimming (is it just me or are we awash in the Newcastle and North Tyneside area with kids swimming lessons?!). So I thought this was a great idea for a preschool activity in Whitley Bay. Each class begins with an introduction about the ingredients and equipment the session will be using for the class recipe. Each child is handed an ingredient and they all discuss as a group what it is. During the lesson, games and songs are used to encourage participation and enhance learning. Of course you have to wash your hands before beginning the cooking! Parents stay to “assist” their child, although as the weeks progress, the children need less interaction. All the Fun Little Foodies recipes involve some pre-prepared ingredients and some which the children need to count/weigh/measure. James can manage to pour milk, for example, while Noah needs a bit of help, but both can level off the flour in the scoop. The children wear aprons while cooking, and personalised aprons are available for order. If you wanted to gift some sessions an apron would make a great add on. 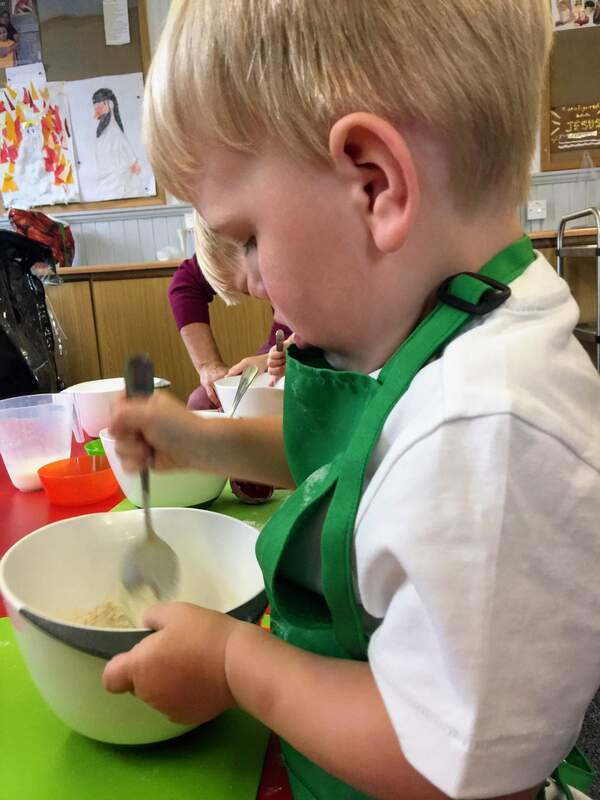 Each week, Fun Little Foodies has a new recipe for the little chefs to make, but space is limited and classes fill up in a flash, so get booked on quickly to reserve your spot! 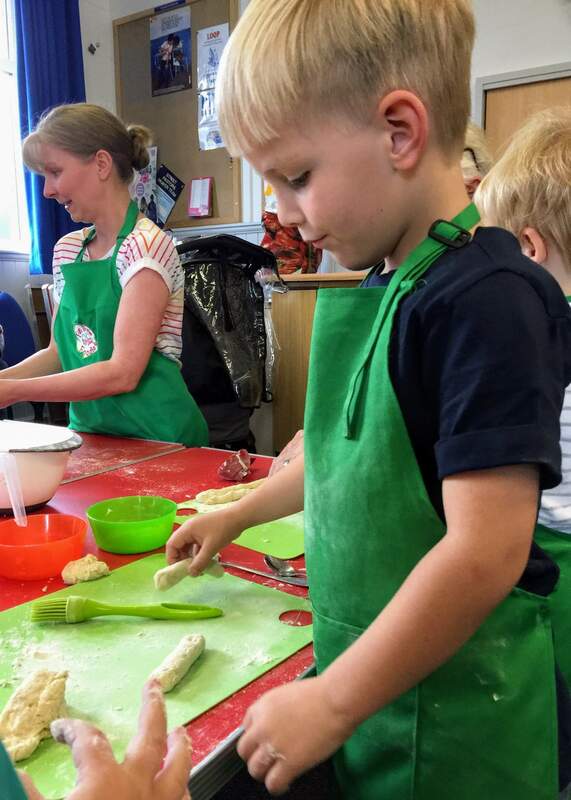 For a full listing of classes, check out the weekly classes page on the Fun Little Foodies website. We talk about and taste the food and use lots of language and numeracy skills in the process. 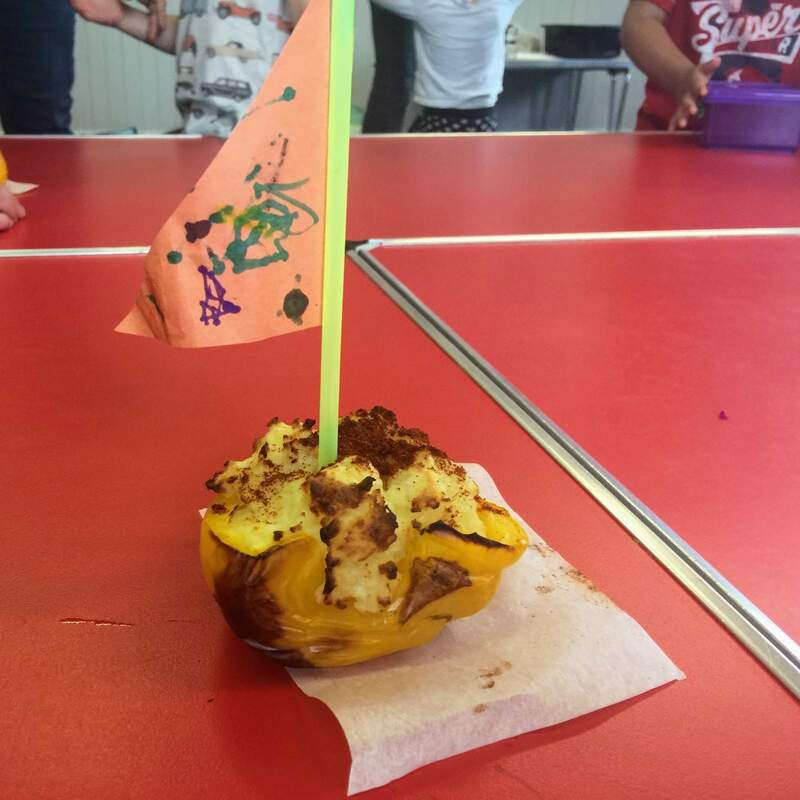 For example, last week the children tested lots of different foods to see if they would sink or float. 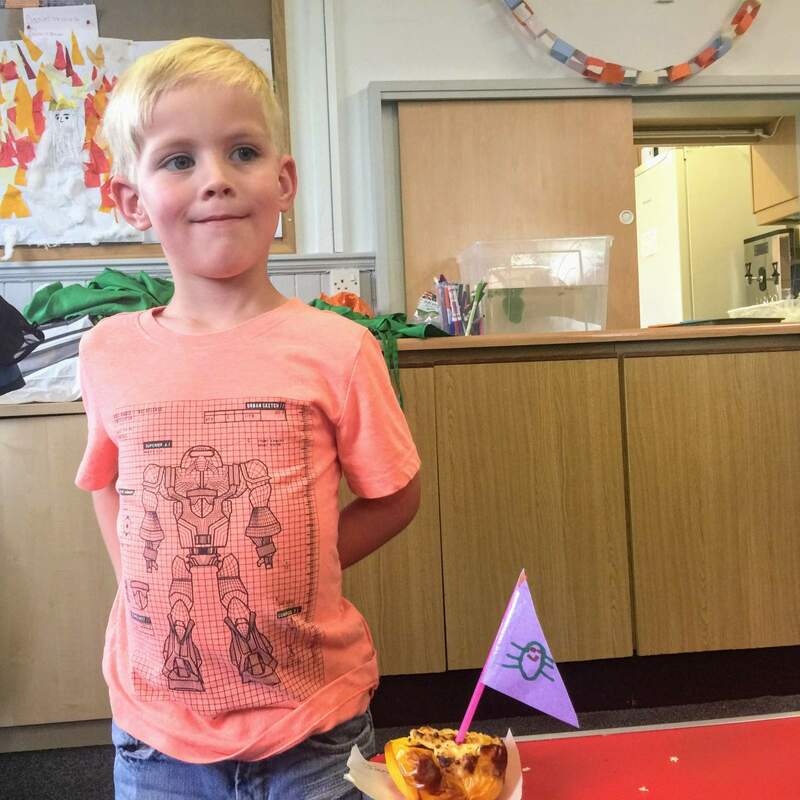 When the children have prepared the food, Katie and Kirsten cook or refrigerate (as needed) while the children move on to a linked activity, such as crafts, stories, songs or games. I love that there’s a book connected to the theme. Today we enjoyed the story “Not a stick” while our breadsticks were cooking. We then returned to the cooking table to sample our delicious dishes! 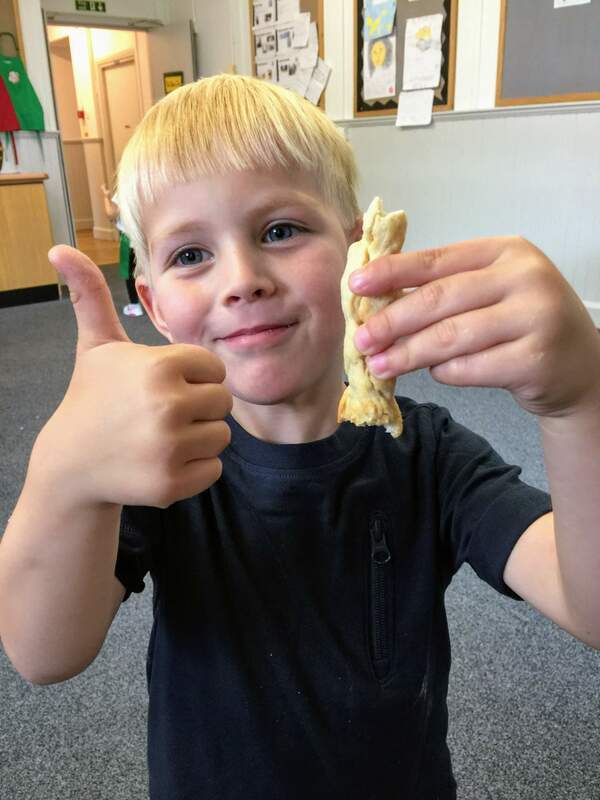 Hummus and breadsticks got two thumbs up from both my children! Be prepared with a container to take home your food. I really like that we are given the recipes on a card to make the dish again at home. Classes are suitable for children aged 2.5 to 5 years. 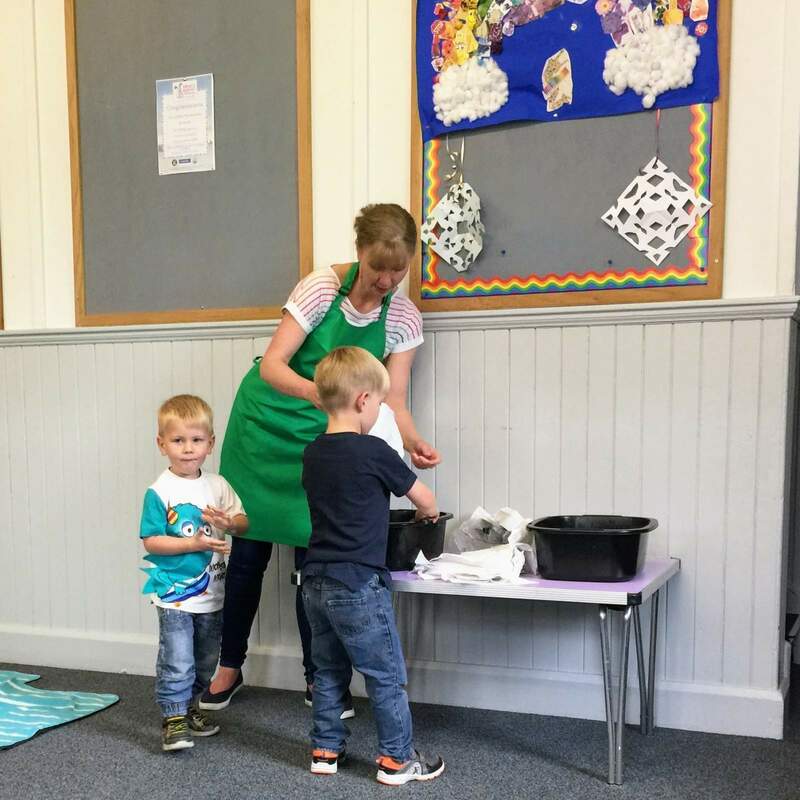 Most classes are held at St Andrew’s Church in Monkseaton, though there are extra sessions on various Wednesdays at the Treehouse in Whitley Bay, and Ouseburn Farm. Check the website for further information. There are also summer classes through August. Have a look at this tweet by Fun Little Foodies for more information about the September classes, and follow for more information (and cooking inspiration!). Enter to win 6 cooking classes with Fun Little Foodies! I have teamed up with Fun Little Foodies to giveaway a block of 6 cooking classes for your little foodie! The block of 6 classes can be used over 10 (ten) weeks and the prize is worth £40. To take part you can gain entries in the draw by visiting Babyfoote and/or Fun Little Foodies Facebook page. Likes and follows are appreciated but not a requirement of the giveaway! Additional entries can be gained by posting on Instagram and/or Facebook a photo of your child cooking, eating, or generally enjoying food (pretend food is fine, too!). Use the hashtag #funlittlefoodies so we can find your pictures or they won’t be counted. See the Fun Little Foodies website for more details of when the classes are held. The block of classes cannot be used for summer specials.